Yes, I look grumpy, but I certainly wasn’t feeling grumpy when the photo was taken! 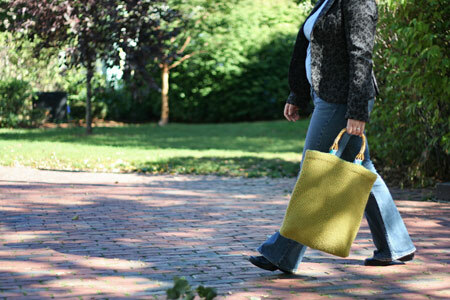 Saturday was such a sunny day, and I was merely squinting in the bright sunlight while promenading with my new tote! Pattern: The Bag by Wendy Wonnacott from No Sheep for You . Yarn: Hempathy by Elsebeth Lavold, 41% cotton, 34% hemp, 25% modal. I used 4 skeins of Vivid Green (017) and 3 skeins of Sunflower (014) (from the Fuzzy!). Finished dimensions: about 14.5″ wide and 16.5″ high. 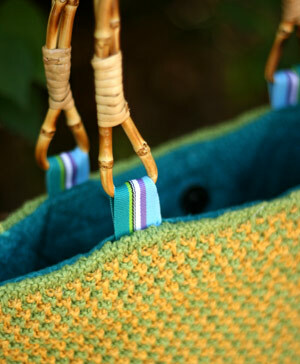 Extras: most of the doodads are detailed in this entry – the handles, the grosgrain ribbon, the fabric lining, and so on. I can’t believe it took me more than 3 months to finish this project! I guess there were some moments when I set it down in favor of other projects. Or maybe it took a while because the fabric is very dense, requiring many more stitches and rows than may seem at first glance. I think Hempathy worked very well for this project – it has a wonderful rustic quality without cramping the body after a few hours of knitting. The yarn is quite soft in the skein, but becomes even softer and more supple after machine-washing and drying. The two colors I used are vivid and lively, though somewhat muted when placed next to each other. I think the teal lining fabric and colorful grosgrain brighten things up a bit. The stitch pattern is simple and intuitive (as long as you mark your sections), and I think knitting this bag is comparable to knitting a simple sock. Not so bad in the portability department, either. The actual bag pattern didn’t do it for me – I ended up converting my bag to a tote, and omitting the flimsy garter stitch handles. But those choices are yours to make after the knitting is finished – the knitting part is the same regardless of the final shape. Speaking of shape… It was important for me to make my tote stable, so I made a quilted lining and used flexible plastic to hold up the top edge. Now I can swing my tote all I want, and it won’t morph into a pile of yarn ;). Wow, that looks great! I am in awe of your knitting and finshing skills. That is absolutely lovely. I may have to make one of those myself. I’ve been wanting to give Hempathy a go. I just finished a bag myself, and I have to say that making totes and purses and bags always makes me so in control of my material world. I love being able to tailor a bag to my exact specifications. I enjoyed watching you go through that tailoring process with this project. Well done! beautiful bag! i love that you used ribbon to attach the handles! That’s so beautiful. I’d be tempted to make it, but unfortunately I can’t really get used to using tote bags. I’m more a messenger bag/satchel kind of girl. The lining and ribbon really set off the colours of the yarn. Mighty impressive stuff! That turned out so awesome! I like it even better than the original! Oh, the ribbon is really the detail that sells it for me. Not sure why, but it’s just darling. Incidentally, I don’t remember if you posted about this or not, but I think I figured out why the bag in the book was so low in contrast. I’ve started working on this pattern (with colors even more contrasting than yours – the recipient’s college colors), and last night I discovered that aside from the obvious color stripes, there are texture stripes as well. Diagonal ridges of garter stitch run almost perpendicular to the color stripes. It’s almost impossible to see in mine, and I wonder if it’s more obvious that you’ve got this other set of stripes if you’re working in lower contrast. I would think so. If I make this bag again, I’m doing colors it in that are closer to each other. Everything about that bag is fabulous. Enjoy swinging it everywhere you go! Your tote looks awesome! Congratulations! Your bag is spectacular! I have some Hempathy waiting at home for me planned for socks, but I may have to invest in more for The Bag! I can’t remember ever looking forward to the completion of someone else’s project like I have been anticipating seeing everything come together on your bag! I think it comes in part from the fact that there’s a special quality about useful objects made with care and attention to detail that is so satisifying. Thank you for sharing! Congratulations on finishing such a lovely project. It is beautiful! Lovely! I love the details, and the colors you chose are some of my favorites too. What a cool bag! I really like how you’ve lined the tote with a different color, and you’re right about how it perks it up. It’s a lovely adaption! Beautiful! What a fashion statement! Wow, it’s a lot bigger than I thought. It’s gorgeous! Bravo. It really looks quite stunning! Your bag looks great!! I love the fabric and ribbon you chose for it also!! Great job! I can really see what you mean about the colors in the last picture..
but… that adds a helluva lotta interest, because as you get closer, you realize it’s a patterned bag! Oh, it looks so sturdy! Nice job on the modifications. I love your jacket, too. What a delightful finished project! I’ve never really considered knitting a bag–I’m more of a sweater knitter–but I’ve really enjoyed watching your progress on this one. Now that it’s done, I’m quite taken with the results. I love the action shots of the tote. It came out great! Very very cute!!! Isn’t it completely amazing that such a fabulous tote can make you look incredibly young, wickedly thin and wonderfully wise???? Gotta love that! It is gorgeous. Pat yourself on the back for a great job. It makes me want to make one and I dont’ need a tote bag, at least I don’t think I do. I may be wrong. totally fantastic, and functional too. love that last action shot. Wonderful! The extra finishing makes the bag look very professional. That last picture is so great! That is sooo cute! I love the ribbons! Lovely! I just finished mine last night (pic on the blog) and am very happy with the result. I started mine after seeing the beginnings of yours, so thanks for the wonderful inspiration! I love seeing different interpretations of the same pattern. I’ve been reading for awhile, but I don’t think I’ve commented before. Actually, looking at the photos, I think we’ll probably run into each other on the street some day. I’ll definitely recognize you by the bag, which is amazing. But I want to thank you for the thoughtful way you shared the process each step of the way. You have a very instructive and enjoyable blog. It’s so pretty! Love it. I love the size and shape… but most of all, those handles! Darling! Very pretty and fashionable. It looks like the perfect size for carrying all those odds and ends we seem to need to get through the day. You’re so right. The lining and grosgrain set it off, cheered it up. Perfect compliment. I wouldn’t have thought to use the handles that work for htis project so well. I LOVE the teal lining! I’ve used Hempathy once – loved it, too. Gorgeous as always! Well thought out…well executed. Bravo. Your finished tote is so lovely that I completely ripped out a finished knitted purse that I had all ready to add a lining to and the handles, when I realized that your tote is infinitely more practical and lovely. 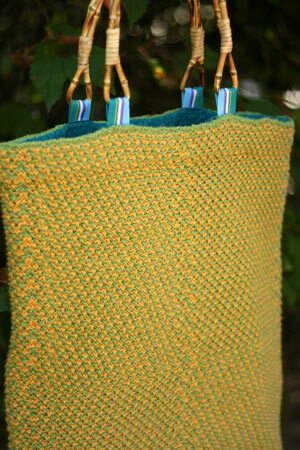 I won’t use a knitted purse, but a tote? That is fantastic. And your mods to the pattern are brilliant! I’ve already washed my silk yarn from the ripped out purse and it’s waiting for my purchase of No Sheep For You. Many kisses and hugs sent your way for the inspiration and brilliance! You are a true and rare gem! Mwa! Awesome! I think my favorite detail is the little stripey bits of grosgrain ribbon at the top – so cute. Great job. Looks great! I love the details! So glad it is done and I love the handles!!! Wonderful! The lining is great, and it looks like it will get a lot of use! That is a great tote! Looks like you enjoy it, the best part of all. That bag is fantastic! I love all of the finishing touches you added to make it uniquely yours. I’m sure it will get lots of use this fall and in the seasons to come too! I’m so proud of you! Your sewing abilities have just increased exponentially – I’m so happy you found a teacher. The bag is adorable, and gorgeous! Ha! That’s funny that you say you look might look grumpy but you weren’t! I often look grumpy when I’m just walking around. In fact, much to my annoyance, people on the street used to tell me to smile and cheer up when I was younger. The tote is wonderful. You did a great job and I really like the colors you chose. Very nice! Have a wonderful week end! So fabulous! I love the finishing touches of the ribbon and the handles. This is really great, and I am sure it will be used all of the time! Enjoy! Appropos of nothing in this post, I was wondering if you could comment on how the Wick stockings are doing. My husband is allergic to all animal fibers (yes, we’ve tried fibers other than wool) but would really love hand knit socks, but he’s hard on socks so I’m concerned about how the Wick is wearing. Any thoughts? Thanks!